How Do You Envisage Africa’s Future In The Year 2050? Why some nations are rapidly declining, while others, on the contrary, flourishing and successful? And why are some countries very poor and others progressing, prosperous or rich? Looking at it, you will see a striking difference between the African continent and other continents. Even though the developed world has been successful through Africa’s resources, the continent of Africa itself where tons of raw materials and resources are taken to the developed world; lies in total darkness. Why and what is causing the snail development in Africa? Economic progress is often used to measure a country's success but since Africa's economy is in crisis, that means there are important factors hampering the progress of Africa. What are these factors which can be taken into consideration? One difference between rich and poor countries is poor countries have less educated and healthy populations. The life expectancy of their citizens is less; while public services do not work well. All these detractors come under one heading, ‘Corruption,’ a word no African leader is interested to hear, yet the twins always walk together. Taking a wider view of successful countries, one quickly notices it is a matter of technology, education and government services which have played significant roles to build that country's successful economy. These give one the idea that there is something terribly wrong in Africa. Education is poor, inefficient government services, including, the judiciary system, poor roads, the lack of electricity and dirty disease-breeding environments, have all contributed to Africa's slow development and economic crisis. In my opinion, since Africa is rich or has made the developed world rich, I believe that African leaders deliberately delay the progress of the continent in order to stay longer and enrich themselves. Talent, ideas, skills, creativity, entrepreneurship are quickly recognized by society and if you want the state to flourish, it must have institutions that can find the use for these talents. This is the task of inclusive institutions. But most African countries do not have economic institutions that create incentives and opportunities. Why does Africa have such unfavorable conditions, with people living on less than a dollar per day, despite the natural wealth of the continent? Many Ghanaians are used to the fact that politics is what improves the economy of a country, therefore, everyone wants to vote for the right party. Politics doesn’t bring success to a country but the efficiency of those under that political party formulates and creates a development model or a successful economy. Switzerland has a kind of historical phenomenon, people made cheese and export pharmaceuticals, machinery including computers, clocks, watches, organic chemicals, optical, technical, medical, etc, yet it’s one of the richest countries in the world because that’s where corrupt African leaders keep their money. It’s very frightening indeed to see Ghana in this depressive economic situation sixty years after independence, therefore, what’s the future of the next generation, including our children? Foxes have holes, the birds have nests, yet the son of man has no place to lay his head. Europe and America smile with happiness when they think of Africa because it's their reservoir, yet Africans live with hopes and dreams, many without knowing where their next meal will be coming from. Africa must unite and utilize their own resources because the continent is not poor. We need efficient, brave and hardworking leaders if ever there is going to be any development on the continent. 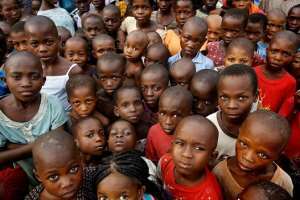 The United Nations predicts that between 2015 and 2050, Africa will add 1.3 billion people, more than doubling its current population of 1.2 billion, therefore, how would the continent's future be like when poverty is far from being eradicated?